← How to compress PDF with embedded fonts by cloud API? How to convert PPT to gif images directly? Question:Hi, we have used the trial versions of your products, i.e ppt to flash converter and VeryPDF flash to gif images converter, we are interested buy those products, before that please send the complete descriptions of both products, and suggest if you have any software on VeryPDF that directly converts ppt to gif images. Answer: When you need to convert ppt to gif image file, you do not need to convert PPT to flash and then flash to gif image file, as On VeryPDF, we have software VeryPDF PowerPoint Converter which can help you convert ppt to gif image file directly. 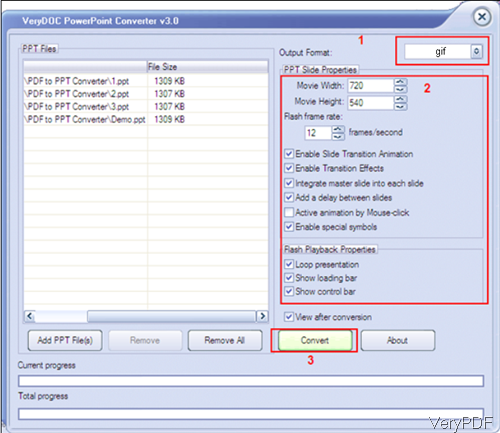 This converter also can help you convert PowerPoint to Flash movie, PDF, PS (PostScript), HTML and MHTML, and RTF formats. But when you use this software, you need to have MS PowerPoint installed or else the conversion can not be done successfully. Please check more information of this software on homepage, in the following part, I will show you how to convert ppt to gif image directly. This software either could be used as command line version software or GUI version software. When downloading finishes, it is an exe file. Please install this software by double clicking the exe file and following installation message. When you need to use it as command line version, please go to installation folder and then call the exe file directly from MS Dos Windows. When installation finishes, there will be an icon on the desktop, simply click it then you can launch this software. The following snapshot is from the software interface, please have a check. Step 2. Convert ppt to gif directly. When software interface launched, please add PPT files to software interface in batch. Choose output file format as Gif and options below it. Then click button Convert to run the conversion. Meanwhile you will be reminded to choose the output folder. A few seconds later, the output GIF file will be shown in specified output folder. When you need to use the command line version, please check parameters and usage in user guide. By this software and this method, we can convert ppt to gif in batch directly, you do not need to use other applications for changing file formats. However, when converting PPTX file, you need to install at least MS PowerPoint 2007 and later version or else the conversion can not be done successfully. During the using, if you have any question, please contact us as soon as possible. How to convert MS Office PowerPoint documents of PPT to GIF? How to convert documents of Microsoft Office PowerPoint to GIF? This entry was posted in PowerPoint Converter and tagged ppt to gif. Bookmark the permalink.